I hope everyone has a wonderful Thanksgiving! We took most of the week off and started our celebration early! We’re up in Rangeley for a few early morning runs and “a Thanksgiving dinner that can’t be beat.” (on Wednesday at least). Can’t catch her! If you zoom in, you’ll see Katie blowing me away on a sprint interval! Lunch Run: The Honey Paw. Best Lunch Ever! So last Saturday our Breakfast Run plans never materialized. We ended up doing our Evergreen Cemetary 6 mile route because our daughters had to participate in morning practices for an upcoming Irish Step Dance competition. So instead we decided that we’d get a run in, drop the girls off, and treat our younger son, Frank, to a lunch date. Not sure that 14 year olds ever are excited for a lunch date with their parents, but even Frank would have to admit that this was an AMAZING dining experience. 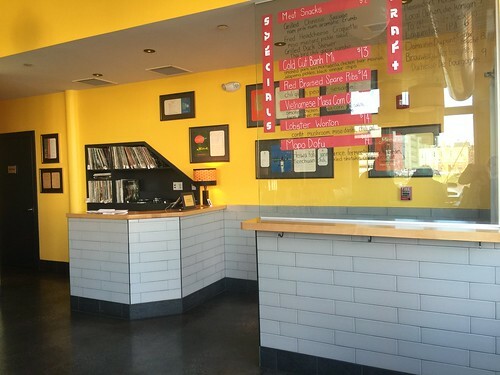 The Honey Paw bills itself as a non-denominational noodle bar (are noodles a religion?). I was thinking it was just a fancy Chinese restaurant. Speaking of Chinese cuisine, is anyone out there still mourning the demise of Wok Inn in Portland? I was a regular, always ordering six dumplings and a pint of pork fried rice with extra helpings of their Duck Sauce spiked with apple sauce. It was Chinese fast food: Fresh, cheap, and greasy fast. I loved it! The Honey Paw is NOTHING like Wok Inn. Just a trip to the bathroom before eating will tell you that. Does that count as a sink? I don’t know, but it is cool. After the drinks, our fabulous server (sorry did not catch her name) offered us some appetizer selections. I gotta say that if you come to The Honey Paw and only have appetizers and drinks you will leave a satisfied customer. We had duck skewers (on special that day…we had two orders they were soooo good!!!) and the brussel sprouts (amazing nutty flavor!). It was hard to beat the appetizers, but the entrees were amazing too! I had a noodle bowl with seafood treats and Frank had a fried crepe concoction that I can only describe as sexually arousing AMAZING! We were going to sample the great looking desserts, but in the end, we decided a walk for some local gelato was in order. BOTTOM LINE: The Honey Paw is an amazing dining experience and I can wait to make another run there!!!! Once again, our daughters’ dance practice conflicted with our breakfast run desires, so we had to adapt. Years ago, I had investigated places to eat lunch in Portland on the weekend and came up kind of short. 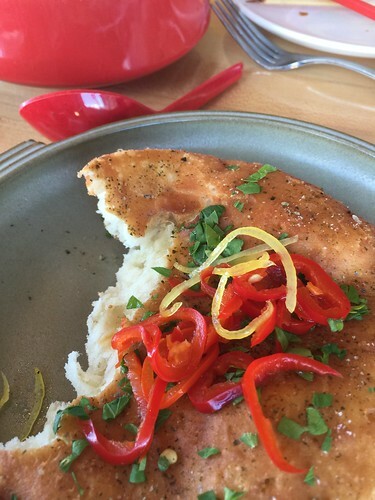 Flatbreads, which I like, was available and that seemed to be about it. Fast forward 10 or so years later, and the options were happily plentiful. 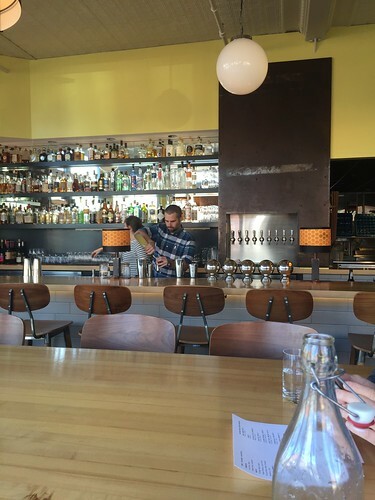 For many of Portland’s hip restaurants, lunch is a great option. It’s usually a bit less expensive and definitely less crowded than the dinner scene. We got up later than we had planned (again, up with the sun did not happen) but managed to squeeze in a run before having to drop the girls off at dance. We were then left with each other, one son, one cat, and one dog. 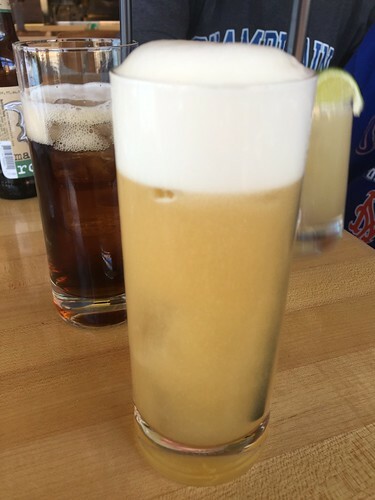 Having burned some calories and not eaten breakfast, we, very uncooly, searched for a place that opened at 11:00, the earliest honorable time to eat lunch (and/or have a non-breakfast-related breakfast adult beverage). Luckily, most places we looked into did open at 11:00. We’d been wanting to try The Honey Paw for awhile, so we decided on that. 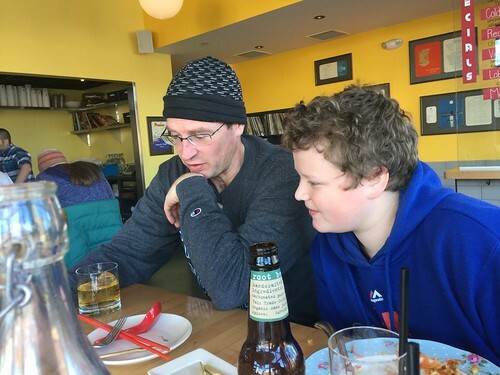 Not wanting to leave our son out, we invited him to come along, and he was game (although I’m still harassing him, with little success, to write a guest blog post on his thoughts of the restaurant). and a ginormous table in the middle of the restaurant, so definitely a family-style dining experience provided you’re not the only family there. Of course, we ordered a drink right away. I was impressed that the cool, hip-looking (probably world-reknowned) bartender started mixing our drinks before the waitress even finished taking our orders. (We were the only ones in there, and I know he overheard, but still, cool.) I ordered something called the “Lapsang Fizz”. (Have I mentioned that I like my bubbles?) It had bourbon, lemon, lapsang souchong (which I assume is some kind of tea), egg white, and soda. I’ve been hearing about egg whites in cocktails for a while. I was intrigued and wanted to try it. It was delicious, but the fizzy cocktails are never as fizzy as I would like. Mike ordered a Strong Paw as I predicted he would, but I’ll let him blog about that, and Frank ordered a fancy root beer. Once we had the drinks figured out, lunch was a bit more challenging. I had read other reviews that recommended the brussels sprouts, so that was a no-brainer. They were delicious. I loved the shredded potato-chip like topping, but I have to say Miyake still has the best brussels sprouts I’ve ever had. We ordered a few other appetizers; the duck skewers which were so amazing, we had to order another plate of them, and the fry bread which was actually my favorite and brought me back to our decades-ago visit to The Four Corners, but gourmet-ized. We were getting a bit full by then but still wanted to try some of the entrees. Mike and I struggled to decide between the Wok Fried Rice Noodle and the Vietnamese Pork Meatball Soup to share. Frank struggled, in general, with the unusual-ness of the menu. He’s an adventuresome eater (he loved the duck), but this was a bit extreme for him. I tried to sell him on the Banh Mi special, but he was hesitant about its Chicken Liver Mousse condiment. 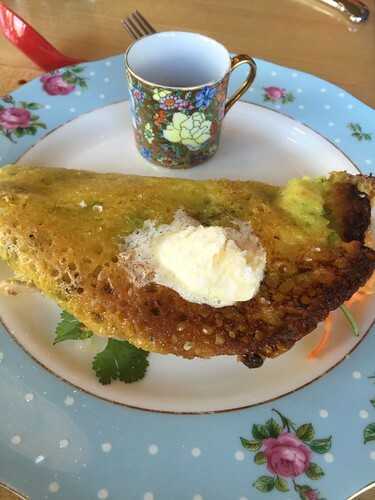 He settled on the Vietnamese Masa Corn Crepe. 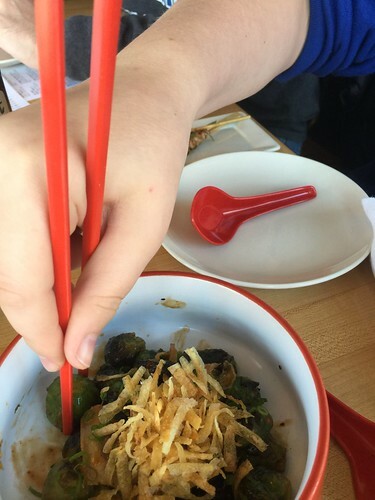 I loved our Wok Fried Rice Noodle. I’m not usually a big shellfish fan, but the mussels in it were delicious and reminded me more of nice, tender calamari. Oh shoot, now I’m reminded that there was squid as well, maybe it was actually squid I was eating, no I’m sure it was a mussel. 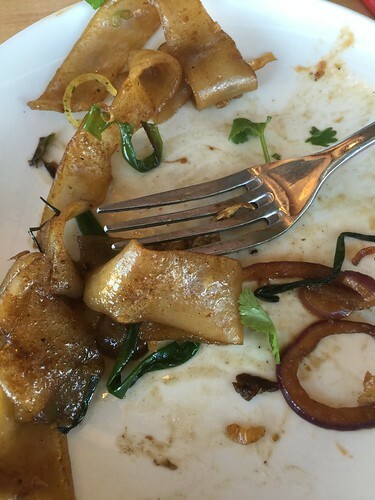 The squid was good, too. Honestly, I wish I remembered the sausage part better, but the noodles themselves were AMAZING, nice and broad with such a wonderful, savory flavor. Frank’s crepe, though, was the high point of the meal for me. The crispy, crunchy, melt-in-your-mouth crepe was an orgasmic experience. That would have been enough in itself, but the melty, farm butter put it over the edge. The crepe itself was so good that I really didn’t even care about what was inside it. That said, the smoked chicken and piccalilli filling would have been delicious as a dish on its own. When we go back, this will be what I order, without hesitation. It was a special, so I hope it’s available. We don’t usually order dessert. I mean, it really doesn’t make sense for breakfast, but I saw the dessert menu first, and since, Mike and I were splitting a meal, I though we might actually have room. I’m not such a big ice cream fan. I know, I’m weird. The walnut cake, however, was calling me. Anything that has an ingredient called “white chocolate butter cream” is not to be missed. And believe me, that was not a misnomer. I was impressed that they didn’t even bother to call it frosting. I mean is frosting really anything but butter and sugar? This was more butter than sugar, and I liked that they didn’t bother to try to hide that. You might think that would be way too rich in a cake, but the blueberry, pear jam cut the richness perfectly. So, so good! I would go back and just get that because after the delicious meal and splitting it three ways, we still couldn’t eat the whole thing. Why, oh why, didn’t I bring the leftovers home? The food was so good, that it could have been in a mobile home, and it wouldn’t have mattered, but the atmosphere of the restaurant was really great, too. The sink in the bathroom was the coolest the boys had ever seen. 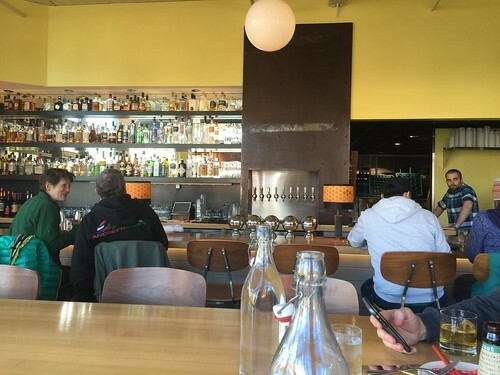 The interior of the restaurant was bright and cheerful. It did begin to fill up as we ate, but being stoic, shy New Englanders, no-one opted to sit close to one another. I could see it getting friendlier later in the evening, later in the drinking. A very cool feature is that they had this cool D.J.-type booth, so the background music was all vinyl. I’ve since learned that they have some events where that is featured. We had a super fun time at the restaurant. It just had such a nice, relaxed aura that we just really enjoyed ourselves. Mike and Frank did some kind of Star Wars trivia game that was, of course, above me. Part of our plan of the day was to visit a local shop called Nomad’s. I had run by there recently and noticed that they had Icebreaker, Ibex, and Smartwool in their window. As it gets colder here, we’re wanting to wrap ourselves in more and more wool, so I was curious to see what this place had. They really had a great selection including our favorite wool socks, Darn Tough, but it was a bit pricier than I’ve seen on-line. Mike did buy a cool Ibex hat and some Outdoor Research gloves. I had the same version last year in mittens which I heartbreakingly lost at a comedy show. They didn’t have any Icebreaker base layer shirts in my size, so the saleslady steered me toward Ibex which did look great but were surprisingly a lot more expensive. I opted to buy one on E-bay instead. After that, we swung buy LeRoux Kitchen (which I remember being Whip & Spoon, do you?) because I had seen on Facebook that they were doing a Thanksgiving meal tasting. It was beyond our expectations. We could have skipped lunch and had this one for free. The was a generous taste of tender turkey, mashed potatoes (that weren’t as good as Mike’s), stuffing, a nice Kale salad, and an interesting tomato thing. To top that off, there was a wine tasting. They had a bubbly rose which I loved and bought to have on our Thanksgiving. Finally, we topped off the day with a stop to Gorgeous Gelato. 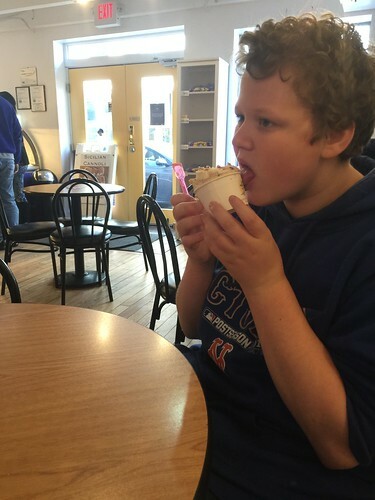 We normally hit up Gelato Fiasco but wanted to try out their across-the-street competitor. As I said, I’m not a big ice-cream fan, so I’m not sure I can make a fair comparison, but I do think Fiasco has more variety. In any case, Gorgeous was delicious, and it was warm and cozy in their home while Mike and Frank polished off some scoops. We finished up our Portland adventure just in time to pick the girls up for dance. Thanks for reading. Happy running and dancing. Tuesday was a big day for me. I had set a goal on January 1st this year to run 2,015 miles before December 31st. It seemed like a big goal at the time, since I ended 2014 at just under 2,000 miles (1966.93, not that I’m keeping track). Woo hoo, I hit it by November 10th! And I still have time to get in about 350 more before the end of the year. On Sunday night, I knew that I was going to be close, so I added an extra mile or two to my Monday and Tuesday runs, so I’d be sure to hit the goal on Tuesday. Tuesday is one of my favorite nights of the week. For some lucky reason, we rarely have kid taxi duty on that night, but, best of all, the next day is my day off of running. I love running, but days off are glorious! It didn’t take much to convince Mike we should go out and celebrate. First we had to get through our younger son, Frank’s, first ever high school parent-teacher conference. 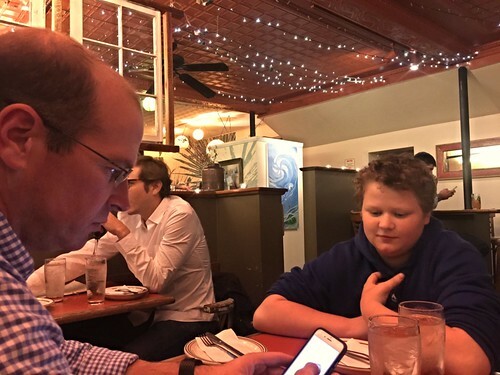 He had texted me earlier in the day to see if we could have pizza for dinner, so I thought we could combine my celebration with a post-conference pizza dinner (as long as we were still speaking after the conference, of course – my older son legendarily got kicked out of his own conference once). I immediately thought of Bonobo, since I’ve been hooked on their pizza since our Happy Hour Run there a few weeks ago (and my subsequent, covert takeout order there one night when Addie had soccer practice nearby, and Mike wasn’t home). We got through the conference without incident and actually got some nice compliments for Frank then headed to Bonobo. Having to park was kind of annoying, since we usually don’t have the burden of the car. As we were walking to the restaurant, it came up that it wasn’t actually Frank who had texted wanting pizza but our older daughter using his phone. (Smart of him not to mention it until we were almost there.) We got kind of a chuckle out of that. Bonobo doesn’t seem to get as much press as some of the other pizza places in town. I actually quite like those places, so, originally, I was a bit reluctant to waste my pizza-eating budget on a different place, but I was hooked – almost the minute we walked in that first time. 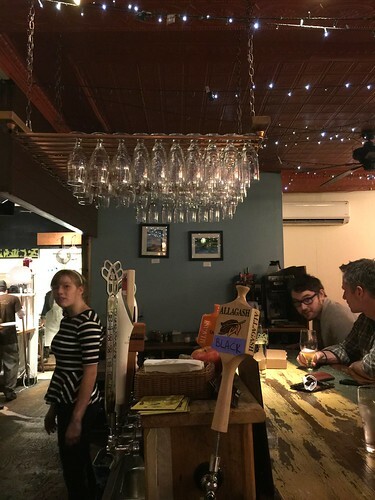 The atmosphere is welcoming and bright (in a cozy, Christmas-y kind of way – not in a spartan kind of way), and it just looks like everyone is having a good time, relaxing and lingering over their pizzas and wine or beer. (Speaking about cozy, Christmas-y, I just recently read about the concept of koselig – check it out – very interesting and appealing.) There are little white Christmas lights strung back and forth across the tin ceiling, a nice bar, and banquettes along the window. It might just be where it’s located, in the West End, but I got a real neighborhood-restaurant kind of vibe from it – in a good way. The first time we went we sat at the bar which was very pleasant. 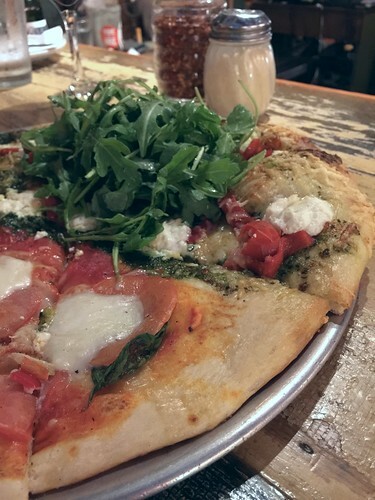 For my half, I had a hard time deciding between the “baby arugula” (arugula almond pesto, roasted red peppers, goat cheese, baby arugula salad on top) and the “gruyere” (potatoes, prosciutto, spinach & leeks, gruyere & parm, roasted garlic butter). I ended up with the “baby arugula”, and it was delicious. My favorite part was the subtle saltiness of the baby arugula salad. 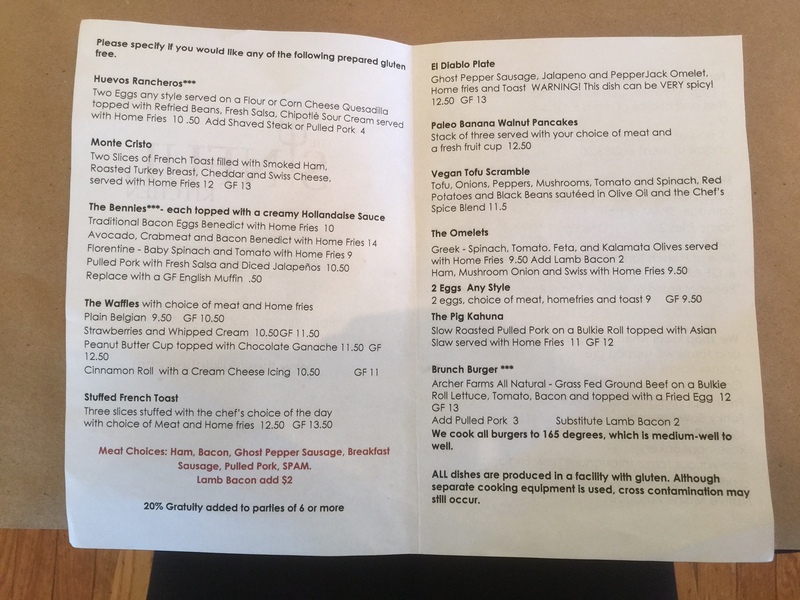 The next time I went, I ordered takeout while Addie was at her last soccer practice, I got a “gruyere” for myself and whichever kids dared to try it and a cheese for those who didn’t. The bad thing about take out is that it was kind of cold by the time I did what seemed like a thousand other errands and got home. It was still really delicious though. The nuttiness of the gruyere really came through, and I loved it. The potatoes were purple which was a fun touch. I liked that one so much that that’s what I ordered when we went to celebrate my 2015. Mike took advantage of the Tuesday (and Wednesday) night special of a $7 cheese pizza, and Frank opted to make the other half of mine a “caspian” (roasted chicken, smoked tomatoes, garlic & basil, mozz, parm & red sauce). I tried some of his, and it was good but not enough to make me stray from my two new faves. 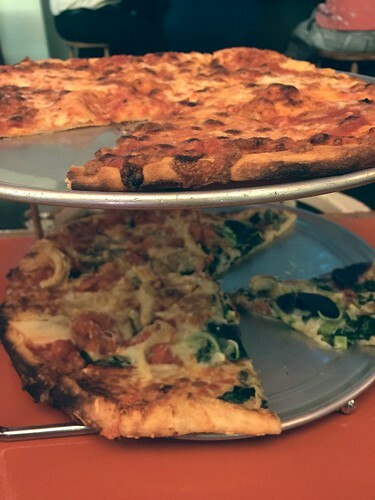 If you’re in the market for a good pizza, definitely give Bonobo a try. What are your running goals for 2015? Have you started thinking about 2016 yet? I’m planning on 2,016 miles (and, of course, some races). 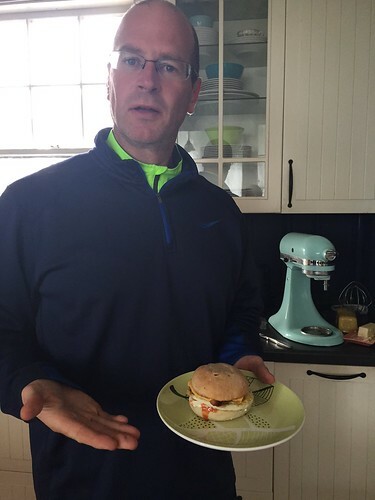 Last Sunday called for a 10 mile run with a stop for breakfast. The run was great! 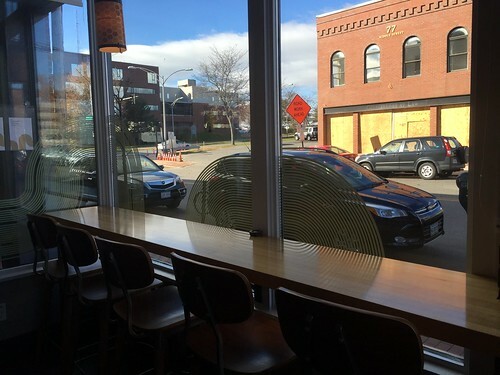 We ran a new route through the Stroudwater section of Portland and then into Westbrook. As we were running, I was surprised that this was the first time I ran over the line into the neighboring town of Westbrook. In the past year I have ran from Portland into South Portland (first time crossing the city line), Falmouth, Cape Elizabeth, Cumberland, and Yarmouth (during the Maine Marathon). Westbrook is closer than some of those destinations, but the routes to there are on busy industrial-type roads. 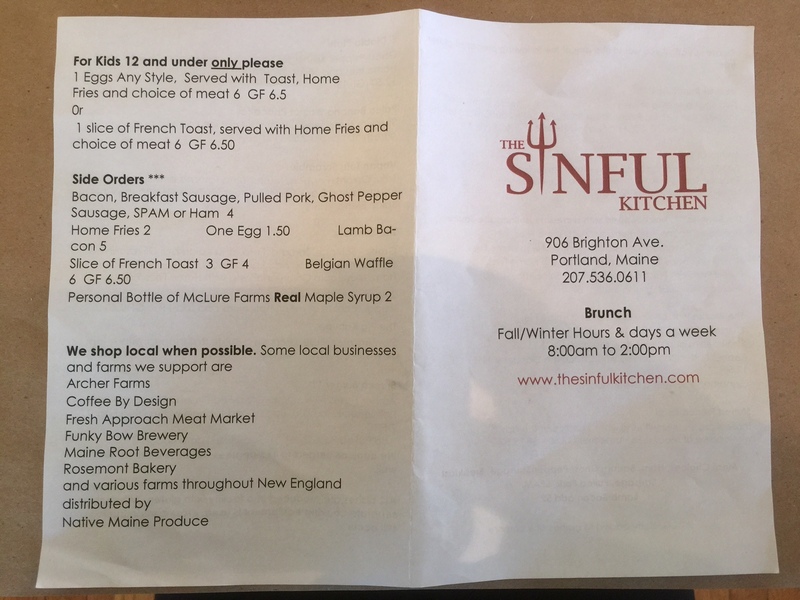 In the early hours of this crisp morning, the roads were quiet and we enjoyed a pleasant paced run towards a fantastic breakfast at The Sinful Kitchen. Can anyone out there explain to us what a “Pharmaceutical Dinner” is? SINFUL KITCHEN “Sinful Bloody Mary” (3 and a half Mary Magdelenes): This was not a full 4 Blessed Mothers (am I getting blasphemous here? 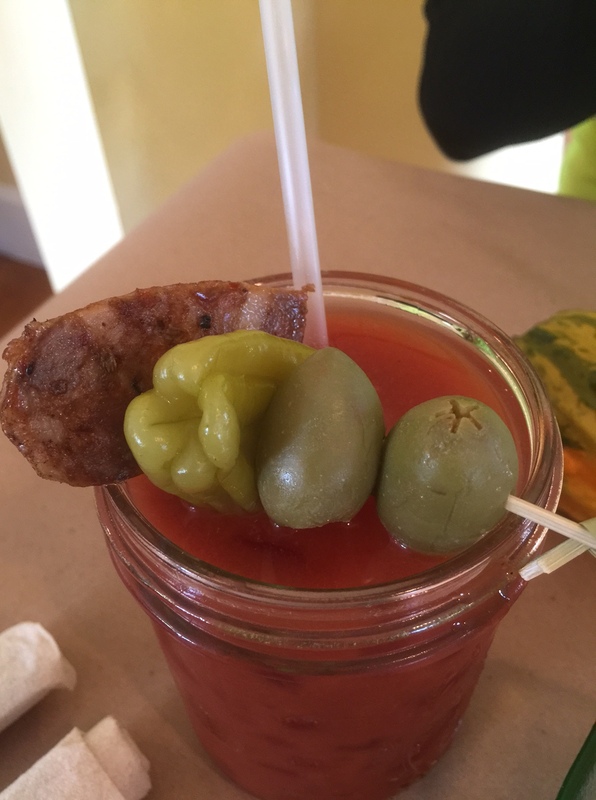 ), but this drink had a nice touch of heat, a healthy portion of vodka, and, best of all, it’s garnish included a healthy chunk of Ghost Pepper Sausage! Look at the beautiful hunk of meat! 2. ABLILENE (2 1/2 Mary Queen of Scots): Abilene had a great traditional (at least what I think is “traditional”) Bloody Mary. Light heat and tasty olives. 3. UNION (2 Mary Harts): I’m sure Union had great quality vodka and other ingredients, but the chipotle flavor really did not work for me. Maybe if you’re a smoky flavor person this concoction achieves the Blessed Mother status. This week, my plan was to go with a savory dish. You know, I’m actually a little embarrassed to say that I’ve only recently learned the meaning of “savory” which in my mind essentially is a non-sweet meal (chicken pot pie was my eye opener). Immediately, my eye went to the Huevos Rancheros. Katie had them at Abilene and I had been jealous ever since. The Huevos Rancheros were delicious!!! 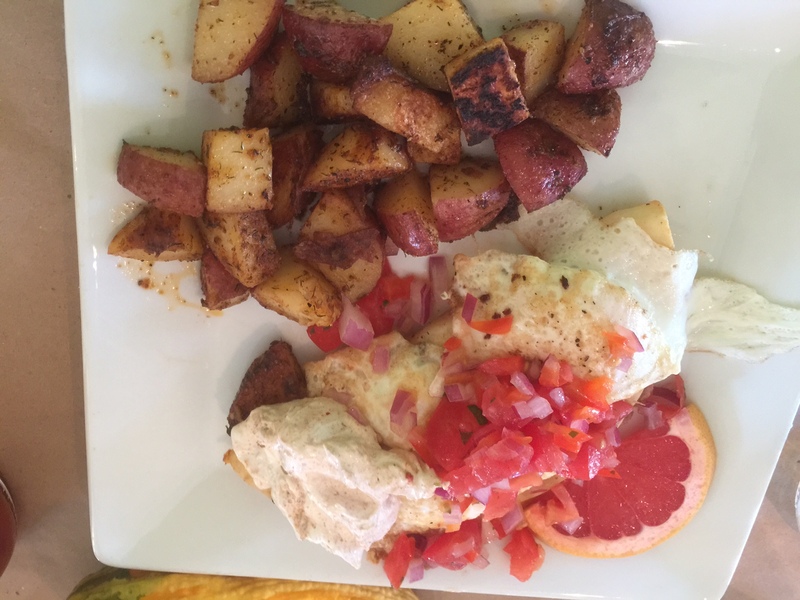 Again, I am a Huevos Rancheros rookie, but the grilled tortilla (flour or corn is available…I went with the flour), salsa picante, eggs to order (I went with over-easy…done to perfection!) provided a medley of flavor that would convert any non-believer. Additionally, the home-fries were perfectly spiced and fried that ketchup was not even needed for me to devour them. We finished a great meal in a packed room with many satisfied patrons. The waitstaff worked hard to make us feel like valued customers and we left as satisfied customers. 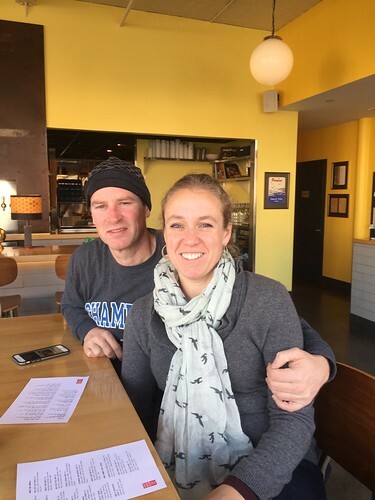 The last 2.25 miles of our run were weighed down by full bellies, but the good eats and libations at THE SINFUL KITCHEN made the struggle worth it! Make your way to THE SINFUL KITCHEN! One of my favorite things to make for dinner is pizza. I use the pizza crust recipe from Roberta’s restaurant in Brooklyn. 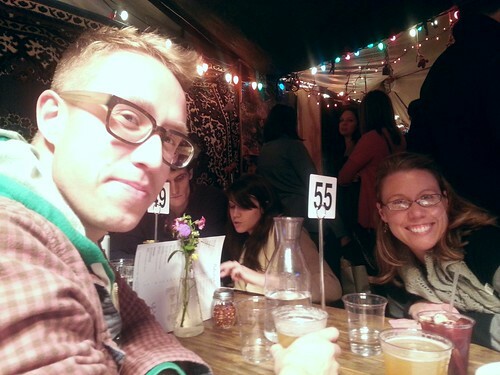 I got to go to the actual restaurant with my brother and sister the night before I ran the Brooklyn Marathon around this time last year. What a great night! I would like to work on perfecting my sauce recipe, but for now, I just use the cheapest grocery store brand if I even use red sauce at all. 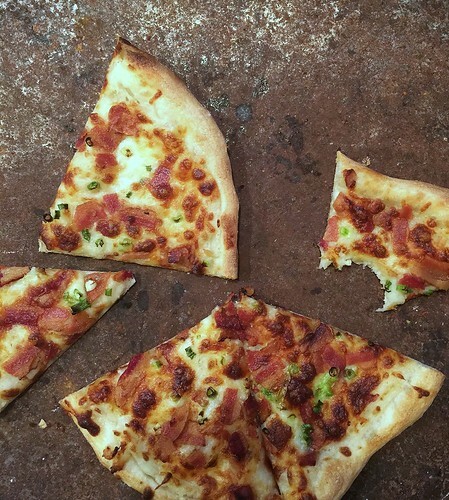 Other than the crust, everyone makes their own pizza. 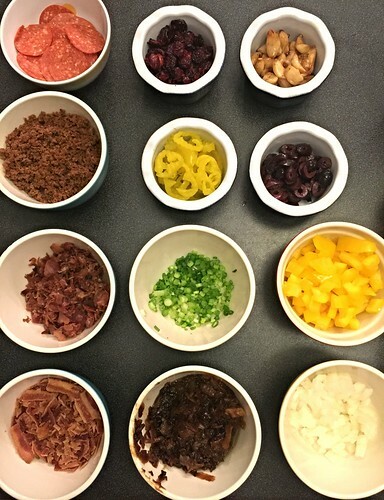 Sometimes, I go all out and put out lots of toppings like I did for my book club recently. Other times when it’s just us, we pull things from the fridge as we find them. One of my favorites is a copy of the Matinicus pizza from Portland Pie Company which has cream cheese, prosciutto, and banana peppers (and red sauce and pizza cheese). Lately though, Joe (my oldest), Frank (my younger son), and I have been working on our copy of Otto’s mashed potato, bacon, and scallion. I think we’ve finally perfected it. Did you know you can buy these funny little mashed potato disks in the frozen section at Trader Joe’s? They heat up in the microwave in less than 5 minutes and miraculously turn into fluffy, mashed potatoes. I think they’re a bit easier than making mashed potatoes from scratch especially when they’re not going to have to stand on their own. Last time, Mike doctored ours up with butter, garlic salt, and who knows what else. They were so good they barely made it on the pizza. I think they’d still be good without the “doctoring”. Thanks for reading. 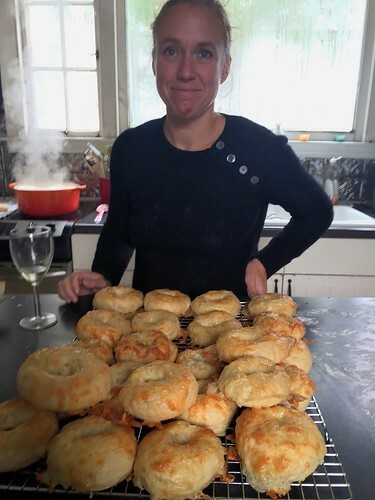 Happy cooking, running, and eating!